Power BI is Microsoft’s latest reporting tool for building impressive visual reports that give insights and meaning to your data. Similar to SQL Server Reporting Services (SSRS), Power BI can create reports for your on-premises data or data sitting in the cloud. However, Power BI’s advantage over SSRS is the interactive data visualizations that you can create with just a few clicks. Power BI comes in two options: Power BI Desktop and Power BI Service. Power BI Desktop is a free download tool from Microsoft that allows you to share your Power BI Reports with anyone in your organization if they, too, have Power BI Desktop. Power BI Service is Cloud-Based and does not require you to download any software to your computer. However, you must have an Office 365 login to use the Power BI App. Most people start with Power BI Desktop to create initial data connections and reports and then publish their Power BI datasets and reports to the Power BI Service to share their reports and create dashboards. Microsoft has also introduced Power BI Server for people and organizations that are not ready to move their data and reports to the cloud. To get started, let’s focus on using Power BI Desktop to connect to an on-premise Data Warehouse. Then, we’ll show how to create powerful visuals. Finally, we’ll look at how to drill down into those visuals and show insights into your data. First, I’ll start by opening Power BI Desktop. Next, I’ll sign into my Power BI Service account, so I can easily publish my reports to the Power BI Service. You must have an Office 365 account to sign into the Power BI Service. *Note that you do not have to have an Office 365 account to use Power BI Desktop. Many other options, including online services and even SharePoint! In this example, I’m going to connect to a SQL Server instance I have running on-premises in my organization and then connect to the AdventureWorksDW sample database. This database is a free download from Microsoft and contains Dimension and Fact tables that all relate to bicycles and bicycle-related sales for the fictional company named Adventure Works. “Import” connects to the data, compresses and caches the dataset into Power BI Desktop, and then closes the connection; you will use this option most of the time. “Direct Query” keeps a live connection to the data and is good for very large data sets. Once you click OK, you will be prompted for your logon credentials the first time you connect. After connecting to that database, Power BI will save your connection string for future reports and datasets. Talk to your SQL Server Administrator to find out which credentials to use for your connection string. Now, you should be connected to your SQL Server database. “Load” pulls in all columns and rows from each table selected on the left-hand side. “Edit” opens Power Query. Power Query allows you to choose which rows and columns you’d like to bring into your data set. Once you click “Load”, you’ll see Power BI loading the data. Power BI compresses and caches all data from the tables you selected to make the dataset smaller and more efficient for use in Power BI reports. As you can see, the visual report shows a breakdown of Adventure Works’ Sales Amounts by Country and also by Sales Territory Region. From this visual, I can see the countries with the highest and lowest sales. I can also see which region inside the United States has the highest and lowest sales. Note that only the US has multiple sales territory regions. You could use this visual to set sales goals for the coming year or set up focused incentives to sales reps in the territories whose sales you would like to see increase in the next quarter. This is just one example of creating a beautiful and meaningful report with Power BI Desktop. Next, try changing the formatting to suit your customer’s needs and use different visuals to give insights to your data. As you can see, you can easily start using Power BI today. But I have just scratched the surface of what Power BI can do for your organization. You can also publish your reports to the Power BI Service, connect data from disparate data sources, and create dashboards. You can use Cortana’s English language query tool to gain further insights into your data. Power BI’s built in tools make it easy to share your data with internal colleagues and external customers. Discover all of these capabilities and more by taking a class with a Microsoft Certified Trainer. Webucator, a Microsoft Certified Partner, offers MOC 20778: Analyzing Data with Power BI training. This 3-day course will help your company start using Power BI. The training covers everything listed here and more. 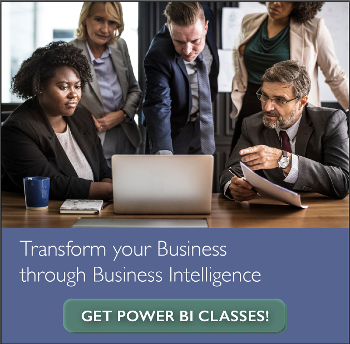 View the Power BI Course details here. Shelley Vinson Helfer is a Microsoft Certified Trainer and consultant in SQL Server, SharePoint, and .Net. She specializes in SQL Server BI (Power BI, PowerPivot for Excel, PowerView, Tabular Data Services) and SSRS, SSIS, and SSAS. She is experienced in SQL Database and Azure VMs.